NEW YORK—In March, heroes must step up, even if it requires an extra five minutes. Kyron Cartwright delivered in the final minute on both sides of the ball as the fifth-seeded Providence Friars (21-12) picked up their second overtime win in as many days, 75-72 over the top-seeded Xavier Musketeers (28-5) in the Big East Tournament semifinal round. Cartwright delivered a jumper from the wing to maintain Providence’s lead at 73-70 with 49.4 left and after Trevon Bluiett’s two free throws, came down and delivered a charge on a driving J.P. Macura at the rim to keep the lead at bay. Friars coach Ed Cooley recognized the physicality during the game and relished in the ability of Cartwright to make clutch plays. “We had to get stops. We were physical and Kyron great job of giving up his body and that was selfless of him,” Cooley said. Trevon Bluiett’s 27-point performance against St. John’s on March 8 felt like a distant memory as Providence’s defense swarmed all over and held the senior to 13 points on 2-of-14 from the field. “Bluiett is one of the best scorers in college basketball,” Cooley said. “You have to be on high alert with him, but Xavier still has a lot of basketball still ahead of them,” Cooley said. Both teams took each other’s best shots in the first few possessions, but a pair of turnovers from Providence turned into layups by Quentin Goodin and Paul Scruggs, respectively, which caused Cooley to call timeout as Xavier’s lead grew to 18-10 at the 11:48 mark. The timeout did not help for the Friars as the Musketeers continued to attack in the paint off the turnovers as they scored the next nine points before Bullock’s jumper ended the string. Paul Scruggs’ ability to block the passing lanes on defense and timely perimeter conversions on offense played a critical factor as Xavier’s lead ballooned to 28-12 and Providence looked lethargic and in need of a jolt. The resurgence came courtesy of an 8-2 run as it cleaned up from its earlier turnovers and began to attack in the paint. Things appeared to be going smooth for Xavier until it missed five of its next six field goal attempts as Providence managed to claw within single digits at 38-29, but Scruggs would be fouled by Cartwright and made all three free throws. Kerem Kanter added a running floater in the final seconds to give Xavier some momentum with a 14-point lead at halftime. 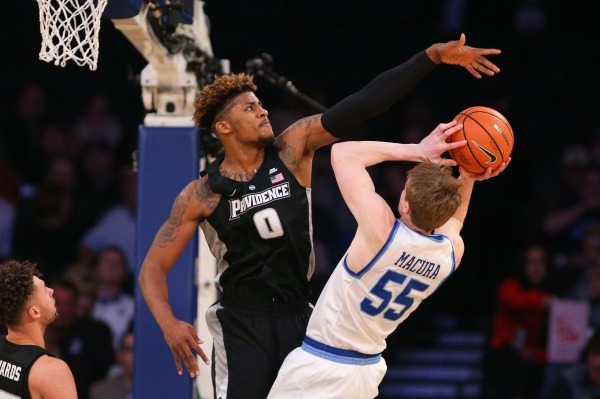 The Musketeers’ shooting woes followed into the second half as it endured another stretch where they missed five out of six shots as the Friars took advantage and went on an 8-0 run to pull to 52-43. Providence continued to chip away at the deficit as Cartwright’s jumper got them to within seven— the closest to the lead since the 11:49 mark in the first half. Friar players fed off the fans’ energy as the Musketeers faced adversity for the first time all game long and continued with a turnover from Kanter, which resulted in a layup on the other end by Nate Watson. Xavier’s control withered as another layup by Watson cut its lead to 59-57. “Nate is a wrecking ball. The more confident he gets, the better. He was great today and his length was great, but he has to play again tomorrow,” Cooley said. The pace began to shift back and forth as one big shot would be matched by another runner by Bullock tied the game at 64 with 3:33 left in regulation as the momentum shifted in Providence’s favor. Both teams exchanged baskets as the final minute dawned with both fan bases in nirvana with the game even at 68. Macura appeared to have had the potential game-winning layup, but would be swatted away by Bullock with fierce as free basketball would be served like a plate from Waffle House on a Friday night. Bluiett drained a jumper to start overtime, but Butler would get no closer as Providence became the first team since the 2009 Syracuse Orange to win back-to-back overtime games. The madness is here and Providence looks to be the face that runs place for now.